I’ve always considered tags on Flickr to be powerful enough to not require sets or collections or any other cataloging. Then tonight I broke down and made a set deciding the presentation is just nicer than a tag index. And it seems fitting for the subject – there’s not much else I have on Flickr with a common theme. I’ve mentioned before that Flickr is becoming more and more a reference resource. People are adding sets of amazing things everyday that aren’t just their latest vacation but rather documents of past things. Things that existed. Design that existed. And it tends to be better quality than a Google image search. It currently lives in my parents’ basement. My last trip home I quickly scanned some packaging on a cheap printer/scanner combo and took some photos in harsh light. Haphazard documentation but better than nothing. Maybe next time I’ll put together a proper set up. Enjoy some nice logos and type. awesome find. that had to be a blast to go through. this one made it into my desktop. wow!! these are so damn awesome. why do your parents have all this stuff at their house? Glad you enjoyed. I believe it was all saved from my grandpa’s warehouse/basement a long while ago. i honestly wish i had a mobile in my room that looks like the one on the cover of this reference book!! what are they gonna do with all of this stuff?…. 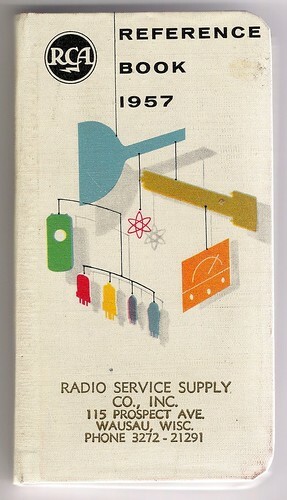 1957 RCA Reference Book. 1 comment.